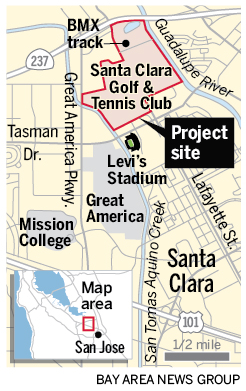 Across the street from the 99% complete Levi's Stadium is going to be perhaps the largest development project in the history of Silicon Valley. The "City Place Santa Clara" project has expanded and is now expected to cover 8 million SQFT (The size of five Santana Rows) and cost $6.5 billion. This epic project would include 1 million SQFT of retail (with 2-3 department stores), 30 restaurants, a 350-room hotel, 380 apartment units, a movie theater, a comedy or jazz club, a bowling alley, a performance center, a "European-style" arts district, parks, plazas, and several million SQFT of offices. For all intents and purposes, this project would become downtown Santa Clara. This would obviously not be built out all at once. City Place would require at least seven phases of construction and take 10-20 years to fully build out. 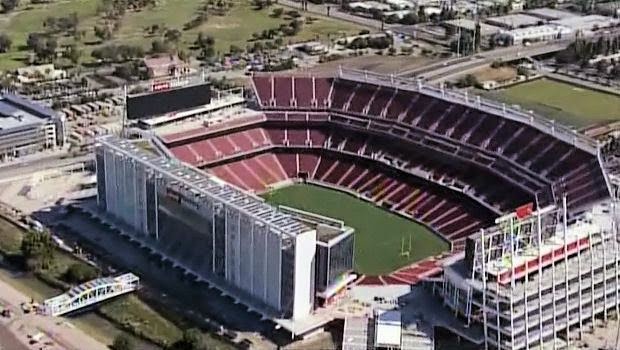 Construction is expected to start in early 2016 and the first phase would open in 2019, helping Santa Clara secure future Super Bowls. So now the question is how will this impact San Jose, whose border is not even half-a-mile away from this project? Will this create synergy and bring increased regional attention to the South Bay or is this just more competition? The last thing we would want is a repeat of what happened with Downtown San Jose when Valley Fair came around. I am going to stay optimistic and say that this is a good thing and can co-exist with all of the projects happening right now across San Jose. Given the increasing residential activity and urbanization Downtown, I think it will be safe. Despite the size of this Santa Clara project, it is still dwarfed by the amenities and scale currently in Downtown San Jose, not to mention what is in the pipeline for the next five years. Wow, a whole 380 apartments? Is that like two apartments per acre. A new Santa Clara 'downtown' in which only 380 people live will be another 'dead' downtown. This was the problem that SJ had in the past (but getting gradually better). No people living there equals a dead area. Plan sounds like big box stores mixed with traffic sewers and parking craters. In other words, another dystopian wasteland that won't be a threat to downtown San Jose. Something closer to the Diridon plan might have been a threat...if the the emphasis was on mixed and balanced housing and retail, transit, and active transport. Agree, with just 380 apartment units this area will be completely dead on weekends (unless there's an event going on in the Levis Stadium). Sure, during lunch time you'll find long waiting lines of all the office workers, but that's not what a "downtown" stands for. Downtown SJ has its work cut out for it. Time to accelerate with the momentum it has right now or be left behind. There are tens of thousands of people that live within two miles. With 30 restaurants, a mall, and entertainment options, I really doubt it would be empty on the weekends. Nothing in this article about the expansion of the Santa Clara Convention Center, which is slated to run in parallel with all this development. That is a big threat to DT San Jose, convention business is crucial and the environment that is being created in Santa Clara will be more attractive than dt San Jose. Further, I strongly agree that the tens of thousands who live within two miles will utilize this "City Place" on weekdays and weekends. I think SC has been craving a city center. DT San Jose needs to fix its "perception of public safety issues", people in Santa Clara think we have gang wars on 1st street daily and that our homeless are going to molest their children as they walk down the street. Considering the build could take a decent amount of time to complete (10+ years), and with downtown San Jose is moving at a faster growing rate than what is offered in Santa Clara, I don't see a direct threat. I believe the tenants will be the final determining factor. If downtown San Jose can finally grab those elusive tenants such as Apple, H&M, Old Navy, etc., then I can't see the Santa Clara development being an issue. Downtown San Jose will look A LOT differently by the time phase 1 is ready. We just need to capitalize. Especially once the first Super Bowl comes around. Out of towners may still fly into SF, stay in hotels there, etc,. Santa Clara won't be able to contain all of the incoming fans for whichever teams make it. San Jose definitely needs to market itself.